Now that my pregnancy appetite has kicked into high gear, snacking has gone from an occasional occurrence to an everyday necessity. 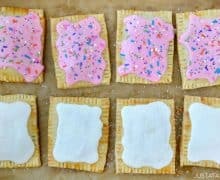 Consuming more calories for my growing little one means I’m always on the hunt for homemade, healthy pregnancy snacks that are quick to prepare and loaded with nutrients. Kick up the classic dip-slash-spread with the addition of nutrient-packed edamame and fresh peas that results in one of the tastiest and easiest ways to eat your greens. 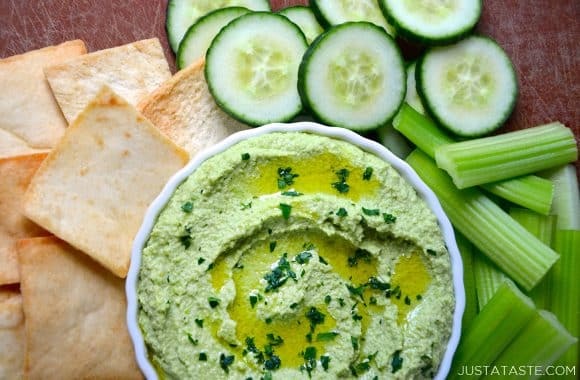 Don’t forget the crunchy crudité or crispy pita chips for dipping! Craving a hot, crunchy, salty snack? 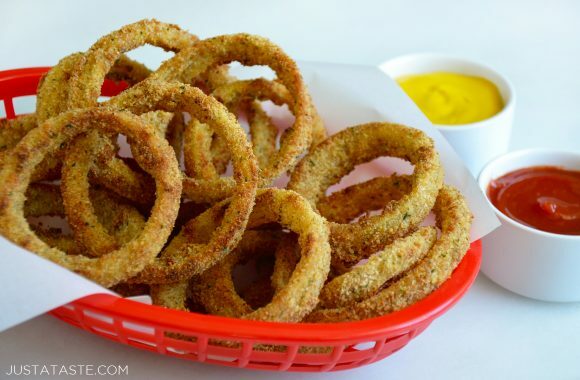 Ditch the deep-fryer in favor of a healthier alternative with this quick and easy recipe for baked onion rings that can be dipped and dunked into your choice of sauces. 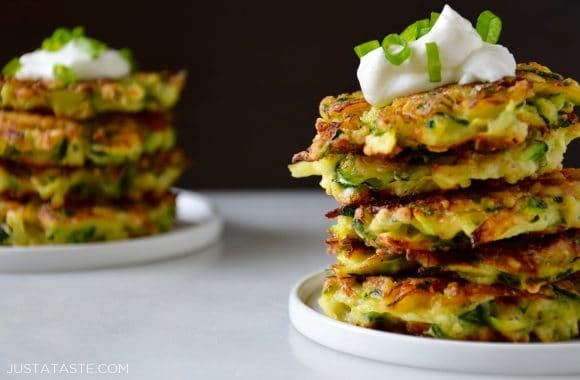 All you need is five simple ingredients for homemade zucchini fritters that cook up crispy around the edges and soft in the centers. Top off a tall stack with a dollop of Greek yogurt or sour cream for the perfect vegetarian snack or quick-fix side dish. 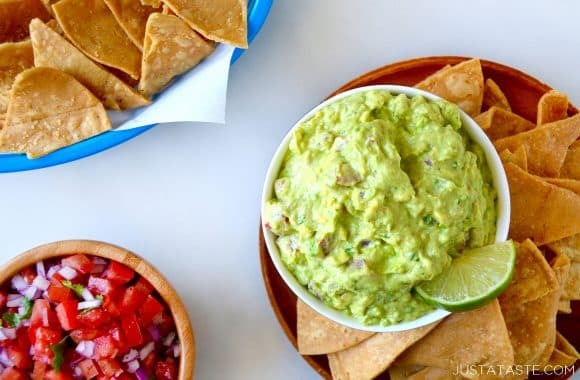 Avocados are one of my favorite pregnancy snacks, and this fan favorite guacamole recipe includes a serving of protein-packed Greek yogurt to make this the creamiest dip to ever cross your lips. 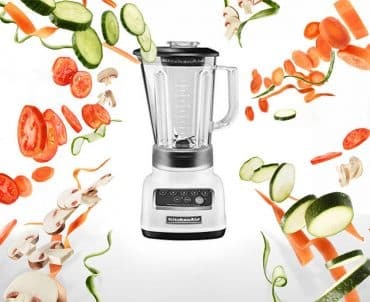 Pile it atop omelets or serve it with veggies and tortilla chips for a refreshing addition to your daily menu. Craving French fries but don’t want the starch? Swap those spuds for your favorite veggies! 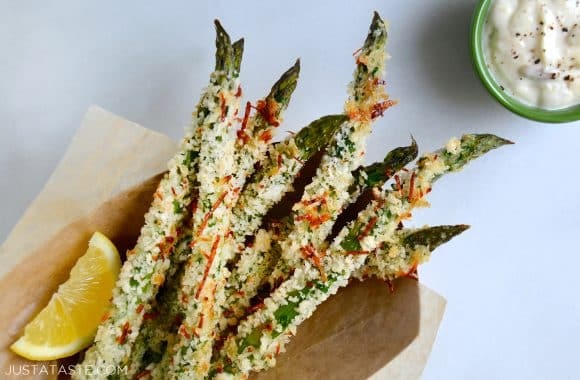 A simple trick ensures a crispy Panko breadcrumb coating adheres to asparagus, mushrooms, squash and more, making these baked vegetable fries the perfect pairing with homemade roasted garlic aioli. Craving more? Subscribe to Just a Taste and Just a Taste Parents to get new recipes, meal plans, and information about all things pregnancy, maternity and parenting delivered straight to your inbox!